January 22, Stage 3: Tilisarao - Juana Koslay 175.8km Trek Factory Racing Team's young Italian professional, Giacomo Nizzolo, outkicked some of cycling's best in the Tour de San Luis stage 3 sprint finish. Giacomo, racing with Trek since 2011, was the overall winner at Tour of Wallonie in 2012, and last year earned multiple stage wins at the Tour of Luxembourg with podium finishes at GP Ouest France-Plouay and the Giro d'Italia. The training and performance team at Trek Factory Racing shared Nizzolo's SRM race file in an effort to illustrate the physical demands of elite stage racing under extremely harsh conditions with high winds and temperatures exceeding 40C (104F). Giacomo races at 184cm with approximately 72kg on the SRM Shimano 9000 11-Speed PowerMeter. January 26, Stage 6: Adelaide 85.5km On Australia Day, the Australian national holiday, the Tour Down Under finished with a circuit through the streets of Adelaide. Riders completed 18 laps of 4.75km totaling 85.5km for the day. In the final lap Lotto-Belisol came to the front. 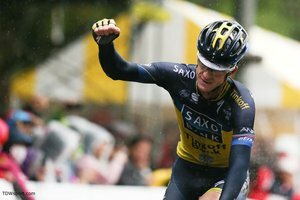 German Champion, André Greipel, and the Lotto-Belisol squad rode a strong and strategic final lap setting André up for victory in the sprint. 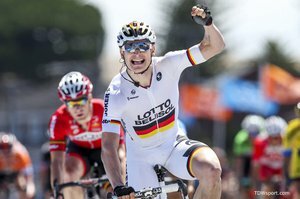 January 24, Stage 4: Unley - Victor Harbor 148.5km André Greipel and team, Lotto-Belisol, took their first win of the 2014 season in Stage 4 of the Santos Tour Down Under. 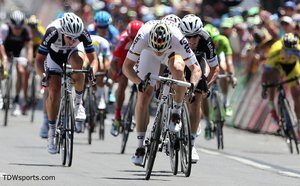 Greipel, the German champion, was victorious in the sprint after 148.5km from Unley to Victor Harbor. Lotto-Belisol teammate, Jürgen Roelandts, who had perfectly pulled the sprint, finished second proving the immense talent in this team powered by SRM Training System. 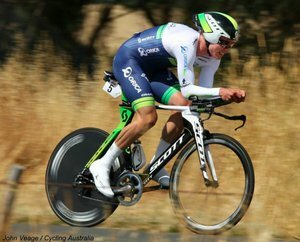 SRM sponsored team, ORICA-GreenEDGE, took a clean sweep of the elite men’s individual time trial at the Mars Cycling Australia National Road Championships. Michael Hepburn recorded a blistering 47.8 kph average pace around the Ballarat circuit to take his first national road title ahead of two-time defending champion Luke Durbridge and Under 23 World Time Trial Champion Damian Howson. Hepburn's SRM file from the race illustrates his outstanding performance on a challenging course, made even tougher by extremely windy conditions.